On the view that end-of-course assessment ought to ask students to review their course and especially the later parts of the course, I tended to set rather straight-forward essay titles. A direct request for a survey of the century could only produce a rushed composite of the material, so I chose to narrow the period to the period 1850–1900 or 1860–1900 (the difference being Riemann ). 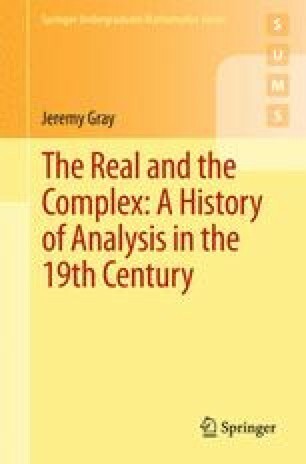 I therefore asked students first to describe the main developments in mathematical analysis in the years 1850 (or 1860) to 1900, making clear what was important about them, and then to consider what were the most important problems or opportunities facing mathematical analysts as the 19th century came to an end. I added that the dates are approximate and may be varied by a few years if it helps their argument, but may not be narrowed.